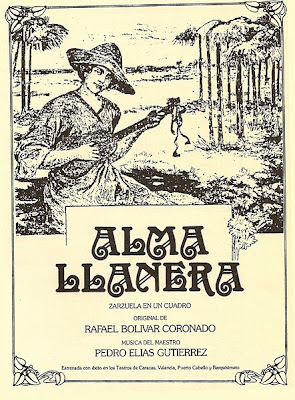 "Alma Llanera" is the country's second national anthem, a song that pays homage to the wide open plains of the Llanos and the importance of "musica llanera" to Venezuela's cultural identity. Visit Venezuela and you're sure to hear this at the opening or closing of a popular fiesta, on TV or the radio. Countless versions of the song exist and smooth crooners like Julio Iglesias and operatic masters like Placido Domingo have all tapped into its popularity. Venezuelan pop group Los Amigos Invisibles even tackled it for their last album "Superpop Venezuela". This version is performed by folk singer and composer "Tio" Simon Diaz (born 8 August, 1928), a legend of traditional Venezuelan music who was awarded a Lifetime Achievement Award at the Latin Grammy's in November 2008. The song has a long history. The music was composed in the form of a "joropo" by Pedro Elias Gutierrez, a band leader from La Guaira, for a "zarzuela" of the same name performed on 19 September, 1914, at the Teatro Caracas. "Zarzuela" was the name for comic folk operas that became popular in 17th century Spain and are named after Philip IV's Zarzuela Palace. The lyrics of the song, which were penned by the writer Rafael Bolivar Coronado, stay true to the "zarzuela" tradition by encapsulating the wild beauty of the rugged Llanos while the music draws on the folk style of "joropo", the music of the Llanos. As you can see from the lyrics (below) Bolivar Coronado created an idealized vision of thundering rivers, white ibises, sunshine and roses and people who love, cry, sing and dream "with carnations of passion". Not surprisingly, "Alma Llanera" became an instant hit and President Juan Vicente Gomez was so pleased with the tune that he paid for Bolivar Coronado to visit Spain on a scholarship from which he never returned. Click here for a video of Simon Diaz singing "Caballo Viejo"
so little out there on simon diaz (at least in english) and music not available on itunes us or uk, amazon or emusic.com! So thank you for sharing these videos and article! 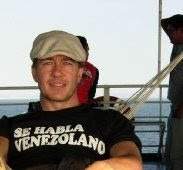 I just discovered your site and look forward to finding musical gems from Venezuela. Do you know Marta Topferova? She reinterprets lots of folkloric latin songs and has an absolutely beautiful voice. Saw her last night at the Green Note in Camden and was utterly in awe. She is how i came across Diaz. Alma Llanera es una canción optimista. Cuando lo escuché me sentí feliz. Las fotos en el video fue con la canción y fue fácil de mirar. Second try at posting my comment. You mentioned Choroní --- I was there when I was 5 years old in 1957. A quiet little fishing village --- I loved it. I have a few photos of it from those days. thanks for this beautiful post. I couldnt find the song on the mentioned album of Los Amigos Invisibles "SuperPop Venezuela"... Did they really also played this song? Thanks for this beautiful post. I couldnt find the song on the mentioned album of Los Amigos Invisibles. Did they really played it?